“SharePoint Uncensored: Architecting SharePoint for Governance, Manageability, and Business Value”. 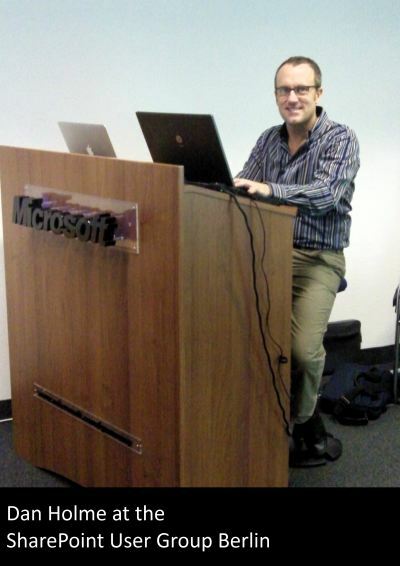 Dan is AvePoint’s Chief SharePoint Evangelist and presented this workshop at the Berlin SharePoint user group on October 24, 2011. SharePointPocast 187 – To BLOB or Not to BLOB? After years of helping organizations around the world to deploy and implement SharePoint, Dan Holme has found that there are certain pain points that almost everyone encounters. Some are confusing concepts. Some are bad decisions driven by Microsoft’s UI and documentation. Some are due to unnecessarily complex terminology. And some because there are things that SharePoint should do, but can’t. In this session, Dan will share the most common and problematic scenarios, and their solutions, with the goal of saving you pain, time, and money. Think of this session as “Lessons Learned,” “Best Practices,” or “From the Field” on steroids. Whether you’re new to SharePoint or a seasoned veteran, in this grab-bag session there will be treasures for you!